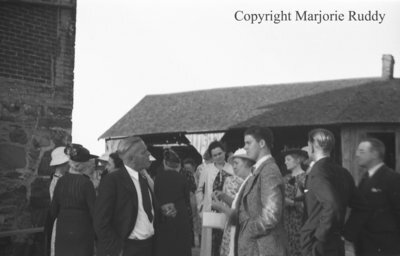 A black and white negative of a group of unidentified people socializing at an outdoor church party in Whitby, Ontario on June 20, 1938. The corner of a church is visible on the left side of the photograph and a wooden building is in the background. Church Party, June 20, 1938, Marjorie Ruddy. Whitby Archives A2013_040_942D.